In 1856 the original Domino Sugar Factory was built in Brooklyn, New York, soon to become the largest sugar refinery of its time. Fast forward to today: In the near future, the 30,000-square-foot facility, which stopped production in 2004, will likely be demolished to make way for a shiny crop of new condos, designed to better suit the ever-gentrifying landscape. It's now, at this uncanny moment in between, that the abandoned factory's storage shed serves as a temple of sorts, a confectionary cathedral posied to rot, housing inside it a 75-foot long, 35-foot high, sparkling white, sugar encrusted sphinx. The massive beast arches her back proudly, with ample breasts and rounded rear propped up for all to see. Her shape is sexualized, though you'd be gravely mistaken to think this monumental and otherworldly form could ever be victimized. The handkerchief-sporting sphinx sternly gazes forward, her eye level towering above any prospective viewer's. Despite her piercingly white exterior, the sphinx's facial features reveal an unshakeable resemblance to Kara Walker, the artist who made her. 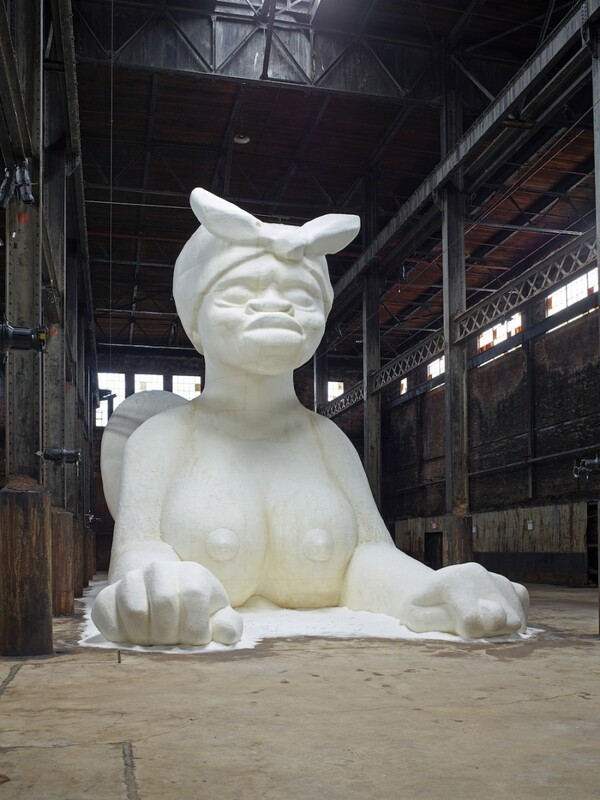 Walker's piece, is titled in its entirety, "At the behest of Creative Time Kara E. Walker has confected: Kara Walker -- A Subtlety or the Marvelous Sugar Baby an Homage to the unpaid and overworked Artisans who have refined our Sweet tastes from the cane fields to the Kitchens of the New World on the Occasion of the demolition of the Domino Sugar Refining Plant." Walker describes the ceremonious speaker behind the lengthy designation as "the voice that I tend to assume whenever I'm making work, one that presumes that I have some kind of authority over it." The title's content was inspired by medieval sugar sculptures, called subtleties, which appeared on the dinner tables of kings of modern Europe. If the sphinx is the subtlety in Walker's surreal scenario, we viewers are crumbs of food on the table cloth. Anyone who steps foot in the Domino Sugar Factory will realize immediately the work is in no way, shape or form subtle. Yet Walker isn't known for subtlety. The New York-based artist primarily works with cut-paper silhouettes that turn the horrors of the antebellum South into a surreal theater of the absurd, ripe with ugly stereotypes, sexual brutality and unending violence. The grisly subject matter is both hyperbolized in its obscenity and minimized in its solemnity, crafting a stomach-jerking recipe that has captivated and infuriated the art world for twenty years. For "A Subtlety," Walker traded in her two dimensional cut-outs for a three dimensional sugary sweet sculpture that, despite being semi-edible, gives the impression that it could easily consume the measly viewers at her paws. "Creative Time approached me about the project sometime last spring and it was such a beautiful space," Walker explained to HuffPost of her decision to work in sculpture. "It sounded better to have a thing -- a thing in the room that would echo the thingness of the Domino site. It's very cathedral-like, it has a very specific quality to it, which I think is calling out for a thing rather than an action." "The process of refining sugar really only serves one purpose and that is to turn sugar from brown to white," she said. "In earlier centuries, people saw sugar as emblematic of this kind of capitalist, democratic impulse, where anybody could potentially come up through the ranks and refine themselves. They'd become pure and desirable -- it's a way of being in the world." Walker explained how for centuries, 24 hours a day, seven days a week, sugar was refined in a bustling space of exploited workers who, perhaps less blatantly, were attempting to refine themselves. "[The factory] is holding onto its history in a way; it's holding onto its mystery also. The 95-square-foot space that was once churning with activity, buzzing with energy and life and strange odors and steam." The historically and symbolically loaded space holds onto its history, quite literally, in the form of molasses, which is dripping off the installation's walls. "Molasses is one of the by-products of the refining process," Walker explained. "I got really interested in molasses because so much of the interior of the space is filled and covered with it. It's like oil paint in that it never really dries. It keeps moving -- it's stuck, but at the same time it's still fluid and mobile." It's easy to see -- and smell -- molasses as the memories of the old factory made flesh, stuck in this abandoned space though still not quite congealed. "Molasses is this by-product that is more nutritious than refined sugar, but less desirable. It has, for centuries, been aligned with slavery and servitude. Plantations, characters like Br'er Rabbit, Uncle Remus or Aunt Dinah, these slave caricatures, narratives and tropes often reference molasses. I found that an interesting fold over." Walker also references slavery in her colossal creature, a beast both human and not. "It's a reflection on the problem of humanity that has or hasn't been afforded to blacks around the world and African Americans, particularly under slavery, where there was an equation of human and animal." Though allusions run thick throughout Walker's installation, she resists the role of authoritative truth-teller. "I can only provide an unreliable narrator," she said. 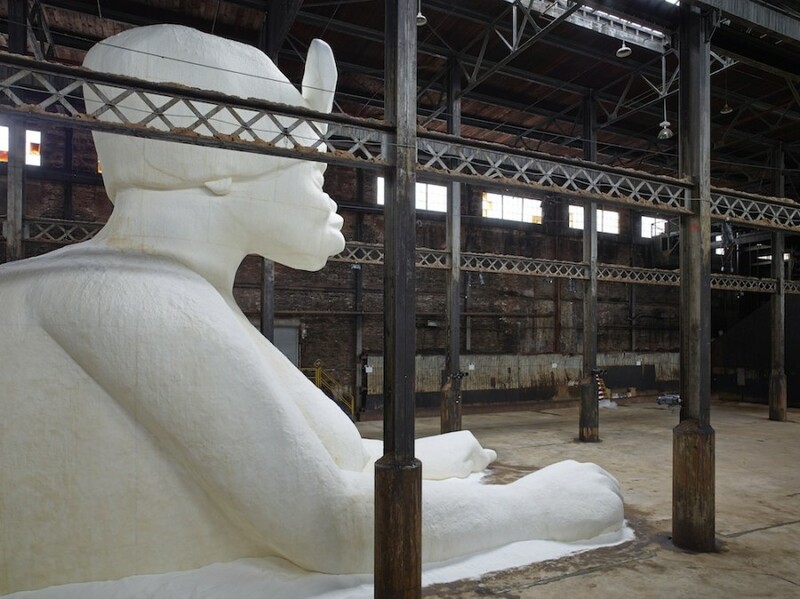 Until July 6, the Domino Sugar Factory will ooze its bittersweet history for all to see, the many implications of sugar, the slave trade, industrialization, and gentrification remaining an unsolved riddle that only Walker's sphinx can realize. After this, the building's future remains uncertain, as do the many ghosts who inhabit it. "What I'd really like to see is that a mass of human beings would see the piece and love it so much that they'd want to keep the site and the piece forever and ever in that space," Walker said. "But the definitely sad reality is that, probably, all is lost." "Once it's changed, once the waterfront becomes a different sort of waterfront than it is today, with condos and different kinds of families and all of the things that are inevitable in a city like this." Imagining the future wave of pristine condominiums ousting the textured, historic space, it's hard not to see another repetition of the same pattern of refinement. "If just a feeling of the presence of this piece, the presence of this building, could remain as kind of an echo, an after effect, that would be amazing." 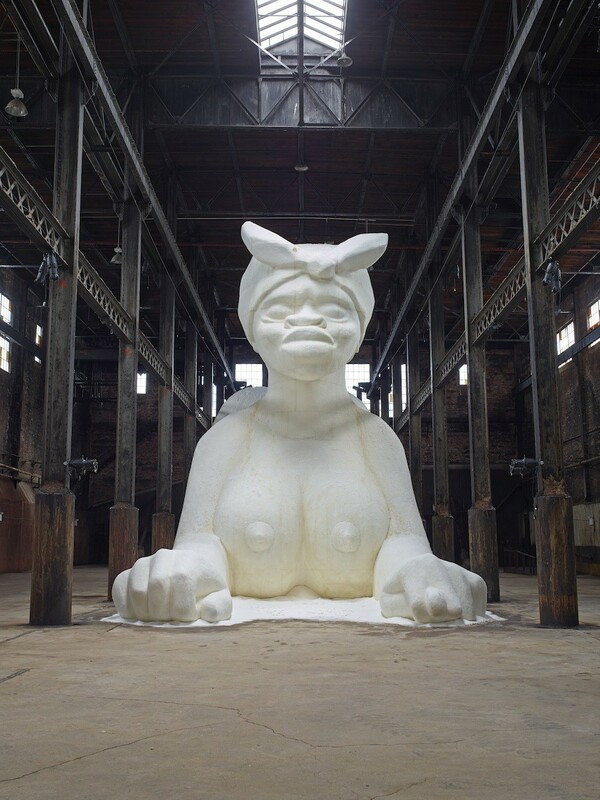 "At the behest of Creative Time Kara E. Walker has confected: Kara Walker - A Subtlety or the Marvelous Sugar Baby an Homage to the unpaid and overworked Artisans who have refined our Sweet tastes from the cane fields to the Kitchens of the New World on the Occasion of the demolition of the Domino Sugar Refining Plant." will be open from May 10 until July 6, 2014. It is free and open to the public. See more photos, courtesy of Brooklyn Street Art, here. Born in 1986 <a href="http://jacolby.com/home.html">Satterwhite</a> combines video, performance, 3D animation, fibers, drawing and printmaking to explore memory, desire and heroism. His most recent exhibition repurposed drawings and songs from his mother, who battles with schizophrenia, to create new narrative possibilities. Still from "Reifying Desire 5", 2013. Courtesy of Monya Rowe Gallery, New York. Courtesy of Monya Rowe Gallery, New York.